For a more durable bead-besotted look, try Glam and Glits’ pre-mixed Caviar Acrylic. 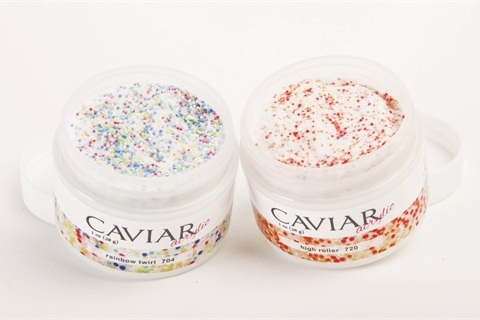 The sculpting powder already has the caviar beads and glitter included, meaning you just dip your brush in monomer and apply. No messy application or falling flocking with this clever nail art product. Although Glam and Glits founder Michael Duong no longer does nails in the salon, he still tests each product to ensure quality and workability. For more information, visit Glam and Glits.